Babara Rae, painter, printmaker and teacher. Rae studied at Edinburgh College of Art from 1961 to 1965 where she was awarded a travel scholarship, taking her to work in France and Spain in 1966. From 1966-1970 She attended Moray House College of Education and then taught in Edinburgh until 1972. 1972-74 She lectured in Drawing, Painting and Printmaking at Aberdeen College of Education and Lectured in drawing and Painting at Glasgow School of Art from 1975 to 1996. Rae’s work has been exhibited in many solo and group exhibitions both nationally and internationally. 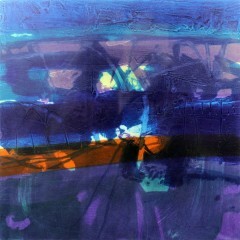 Her first solo show was held in 1967 at the New 57 Gallery, Edinburgh. 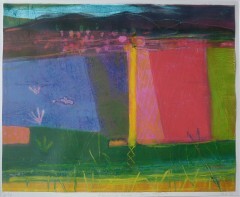 In 1994 and 1999, she won tapestry commissions for The Festival Theatre, Edinburgh and for the Royal Scottish Museum, Edinburgh, respectively (both carried out by the Edinburgh Tapestry Company).In 2003 Aberdeen University conferred an Hon Doctorate on Rae and the Royal College of Art an Hon Fellowship. Rae’s work is included in many private collections in Britain, Europe and the USA, as well as in many public and corporate collections.